Explain how the strategies you selected were implemented and evaluated in terms of their effectiveness. Include both qualitative and quantitative performance information. 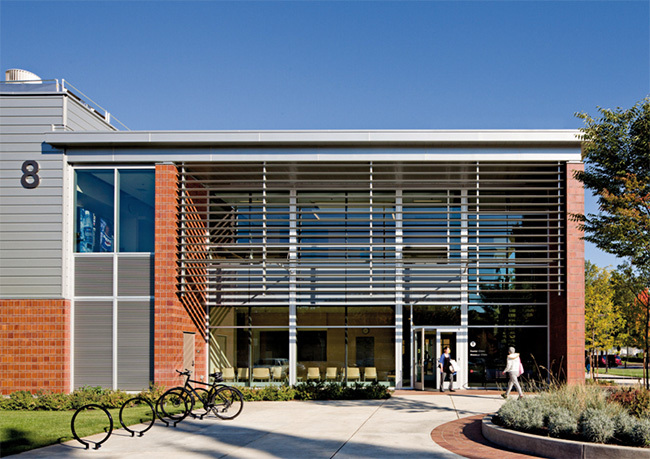 The Chemeketa Health Sciences Classroom Building is particularly significant because it was designed as a major new multi-story building without any air conditioning. The means to achieve this included natural ventilation and night flush, comprehensive daylighting, extensive solar shading, additional mass, and a super insulated skin, all resulting in a modeled EUI of 27, actual measurements indicate EUI of 31. One of the major challenges to implementing these strategies was convincing the College that the building would be comfortable all year round. A transparent process was key, along with ample detailed computer simulations. It also required some education in terms of the client so they were willing to accept a greater temperature range. We shared all of the data we developed and took them on tours of similar buildings. We showed them what the indoor temperatures would be when there was a week of hot weather. The studies included CFD of the natural ventilation air flow, TAS studies of the impact of mass on the temperature, daylight studies of light distribution within typical rooms, and studies of different shapes of exterior sun shades. Daylight enters the classroom from the clerestory windows and the light shaft at the core of the building and is distributed evenly, as represented by the red line in the graph (right). Exterior louvers at the windows act as light shelves by reflecting light further into the classroom and eliminating glare (also done by the overhang), thus helping to even the amount of daylight across the space. The light shaft provides light to the portion of the classroom near the building core. Describe design trade-offs and interactions. In order to provide comprehensive daylighting and passive ventilation throughout the building, the roof is filled with turbine ventilators and skylights. This leaves very little room for effective photovoltaic arrays. Consequently, most of the photovoltaic panels associated with this project are on an adjacent building. Since this facility is part of a campus with many buildings, that was an easy resolution. Buildings without mechanical cooling remain comfortable in this climate as long as there's not heavy use during the hottest days, which typically occur in late August. Fortunately at that time the College has the greatest flexibility in scheduling classrooms and can easily avoid using the classrooms which have the greatest risk of overheating, typically on the top floor of the south side of the building. A wide variety of configurations for the exterior shading devices and the light shelves were also studied. The key to controlling cost is to avoid redundant systems. If the building is going to rely on passive ventilation and night flush for cooling, then mechanical air conditioning will not likely be in the budget. Many architects try to provide both and thereby increase the construction cost. However, the design team opted to essentially shift cost from the mechanical system to the exterior skin and the controls. In other words, money was taken from the HVAC to pay for operable windows; the building skin essentially became a part of the mechanical system. A wide variety of configurations for the exterior shading devices and the light shelves were studied. The key to controlling cost is to avoid redundant systems. If the building is going to rely on passive ventilation and night flush for cooling, then mechanical air conditioning will not likely be in the budget. Many architects try to provide both and thereby increase the construction cost. However, the design team opted to essentially shift cost from the mechanical system to the exterior skin and the controls. In other words, money was taken from the HVAC to pay for operable windows. Essentially, the building skin became a part of the mechanical system. Describe both positive and negative aspects of the process. Include the composition of the project team that allowed goals to be met. Project Team. All members of the design team were very familiar and comfortable with the strategies used for this project, and these firms have worked together extensively. Both aspects were critical to reaching our goals. Successful strategy implementation required a number of unique qualities from the design team: Strong client and design team leadership by the architect Confidence by the mechanical engineer deviating from ASHRAE standards A lighting designer familiar with being integrated into daylighting strategies A consultant or consultants able to perform detailed daylighting, TAS and CFD analysis A team both familiar and comfortable with "integrated design" In addition to the typical team of engineers, the project team included a separate MEP firm that performed an energy study, as well as academic research organization Energy Studies in Buildings Laboratory (ESBL) that performed some of the detailed studies. SRG has been working together with ESBL for more than 13 years, pursuing and refining these same strategies. This collaborative effort largely contributed to the holistic expertise required to achieve the project's ambitious goals. Educating the Client. Designing a major new multi-story building without air conditioning was a first for the design team, which had only designed portions of buildings without air conditioning and buildings with limited cooling capacity. It also posed a challenging risk for the client, particularly since the integrated design approach utilized did not allow room for significant options; they had the choice of being completely on board from the very beginning, or staying with conventional systems. Innovative design tools demonstrating that the building would be comfortable all year-round were critical to convincing the client to push for a sustainable building free of air conditioning; these computer simulations were shared with the client throughout the design process. It was demonstrated that the building would not cost any more to build than a conventional design, while saving nearly $50,000/year in operational costs. In addition, the design did include space and basic provisions to accommodate future air conditioning if it was ever deemed necessary. This "insurance" served as another important strategy in addressing the client's concerns and minimizing the risks. The building participated in the Energy Trust of Oregon's pilot program "Path to Net Zero," which required it to use 60% less energy than the code requirement. This resulted in Chemeketa Community College receiving more than $130,000 in cash incentives for energy modeling and installing energy-efficient systems and equipment. Comfort. The design approach relied upon research which shows that an inside temperature of 80-82 degrees is comfortable if the surrounding building mass is cool and air movement is present. These conditions result in a perceived temperature of 76 degrees, which is within the standard acceptable design temperature range for conventional buildings. Thus throughout the design process the goal was to make sure the mass temperature was sufficient so that the indoor temperature was 82 degrees or less. Ceiling Fans Throughout. Air movement reduces the perceived temperature by two to three degrees. For this reason, every occupiable room was equipped with ceiling fans; there are six in every 30-seat classroom. Added Mass. Building mass is able to absorb heat during the daytime and then release it during the nighttime when the building is not occupied. The cooler surface of the mass reduces the perceived temperature by one to two degrees. The rule of thumb is that a room needs at least two times the floor area of exposed mass; a concrete floor and ceiling typically provide this. For this building, many computer studies were performed to ensure there was enough mass to achieve this effect; each different exposure required a different simulation. We utilized a slightly thicker floor slab as well as additional CMU block walls in a few locations in order to achieve success with this strategy. Passive Ventilation. The building is always full of fresh air. According to Jerry Vessello, the client representative for the project, this is something he appreciates every time he is in the building. The automated operable windows and myriad of rooftop wind-powered turbine ventilators allow the building to "breathe." Both of these features are central to the fully integrated design concept that eliminated the need for air conditioning; the building envelope essentially becomes part of the mechanical system. Nighttime "flush" drawing in cool outside air is the central means of pre-cooling the building. Automated Controls. The night flush occurs automatically and is controlled through the building energy management system. Windows open automatically based on the temperature difference between inside and outside and are programmed to avoid operation during classroom hours to minimize disturbance. Super-Insulated Skin. A critical part of this strategy was the innovative, super-insulated exterior. The project utilizes a new panel system that allowed for achievement of an effective R-25 for the walls. Combined with an R-60 roof, it contributed to the most highly insulated enclosure the design team had ever done. Exterior Window Shading. Projecting window sunshades are the most visible environmental strategy on the exterior. To address the wide variety of orientations, each required a slightly different approach for shading and functionality. Since the upper floor has skylights, the windows just needed shading; on the lower floor, horizontal louvers both shade and act as light shelves to bounce the daylight further inside. The social and collaborative center of the building features generous open spaces and ample daylight, with the Active Learning Center overlooking the lobby through bold graphics on glass. Daylighting. Daylight permeates the structure throughout. There are skylights in almost all spaces on the upper floor and light shafts that channel daylight throughout the ground level. Daylight strongly impacted the interior architecture, encouraging sloped ceilings, two-story spaces, and even the choice of specific finish materials. Daylight harvesting was incorporated wherever possible. This control strategy not only minimizes the energy needed for lighting, but reduces the internal heat gain from the light fixtures as well. One design challenge was to balance the daylight from exterior windows with the light from the shafts so that it was evenly distributed throughout each room. The goal was to have a daylight factor between 2% and 4% across the entire floor area. It should be noted that the light shafts also provide the exhaust path for the night time "flush." The width of the shafts was a variable, as was the configuration of the light shelves. All of the flooring and desktops are light colors in order to maximize their reflectiveness. The skylights are glazed with electro-chromatic glass that changes light transmission properties when voltage is applied to respond to the amount of light outside. A sensor automatically adjusts the amount of light transmitted so that it's not too bright in the classroom. There is also a switch in the room which allows the instructor to darken the glazing for a projected presentation. Skylights and an open layout allow daylight to penetrate faculty offices and collaborative areas. Describe how the project addressed existing site conditions and context including the surrounding community. The College's goal was to expand their existing allied health and science facility, as well as to add a new dental clinic serving the public. They also aspired to bring the faculties of the two programs together to promote communication and collaboration. The solution was to demolish the allied health faculty office appendage on the west side of the building, and then create a new larger faculty office area in this same location. The addition would span out towards the edge of the campus to make the dental clinic easily accessible. The new building would essentially be constrained and stretched to respond to the existing conditions. This solution also created the opportunity to improve the pedestrian walks on either side of the new building; one side has become a major public connection and the other, a private backyard walk. Environmental Awareness. Because this was a science building, expressing stormwater run-off was a specific design goal. The downspouts from the roof terminate in lighted "cauldrons," highlighting the rain gardens with native plantings which surround the building. Because the building is home to the College's allied health programs, the landscape design also incorporates a healing garden. Indigenous plants that were used by the local Native Americans for medicinal purposes surround a special courtyard and have instructional signage. Social Responsibility. The building owner's mission statement begins by declaring, "Chemeketa Community College values access and diversity which is affirmed by how we care, collaborate, and innovate with each other and the community." In other words, social responsibility is why they exist. This building enhances their ability to serve their community by training much-needed health professionals, particularly nurses and dental hygienists. There is also a dental clinic which provides free services to low-income children. The College is also committed to the heritage of its community. In designing the Native American healing garden, they reached out to the local tribe to confirm that its design appropriately reflected the culture. The building was constructed by a Portland-based general contractor who made a concerted effort to involve subcontractors from the local Salem area. The funding for the building came in part from a local bond so the College was committed to keeping as much of that money in the local economy. We established sustainable project goals and strategies while securing buy-in from college administration of low-energy strategies and targets. We designed for comfort, not temperature. The project also provided universal accessibility for students and faculty. New construction was added to the existing structure to improve the existing building and extend its life while also adding needed space for growing programs and campus needs. We maintained our design goals with the contractor, tested systems, and incorporated new information and studies to ensure project success. We trained maintenance personnel on building management and system performance characteristics. We produced a user guide to educate occupants on how to understand and operate the building, provided training on building systems, and conducted post-occupancy surveys. Integrated design was central to the project approach. When utilized effectively and wholeheartedly, it is the means to avoiding any cost premiums. It is, however, a paradigm shift. It requires knowledge and confidence from the design team, strong leadership by the architect and the trust of the client. It calls for extensive and detailed studies addressing daylighting, temperature and comfort. On this project, the mechanical engineer, lighting designer and energy analyst were responsible for these studies. An airflow study, performed with TAS software, allowed for each of the classroom variables; room airflow, mass, lighting and solar loads were analyzed and adapted to achieve the best room performance. The design team met over a 6-week period, adjusting the model and brainstorming ideas for rerunning the TAS model, then reviewing the results the next week. The study was successful in finding the right amount of air turbines, room mass, solar shading and daylighting for optimal comfort. Multiple daylight studies using AGI 32 software were also developed to evaluate the optimal spacing and dimension of the exterior shading devices. Additional daylight studies looked at the shape and configuration of the diffuser/reflectors incorporated into the upper classrooms under the skylights. Daylight studies evaluated the spaces under direct sun and overcast sky conditions on multiple dates throughout the year to verify proper spacing of reflector components as well as optimal shading dimensions. Several interior studies looked at glare potential on white boards to minimize window reflections and optimize teaching conditions while minimizing the need for interior blinds or shades. All of these daylight studies (interior and exterior) helped the design team shape the daylight control elements to aesthetically and functionally fit the building, maximize the daylight potential, and minimize the need for electric illumination. Benchmarking Software / Methodology: Energy Trust of Oregon's Path to Net Zero Pilot program provided external benchmarking methodology for compliance with energy conservation goals. The Active Learning Center's vibrant imagery merges themes of science and health science while offering privacy to those studying within. Cooling loads were reduced by utilizing passive cooling strategies including natural ventilation, shading and increased thermal mass. Lighting use was reduced through aggressive daylighting strategies including high performance glass and electrochromic skylights. Heating energy was reduced through a high-performance envelope and heat recovery ventilation. Total energy performance is enhanced by the extensive metering and trending of specific end uses. In addition, the building's EUI dropped to 23 thanks to the 155 kw of rooftop photovoltaic panels on buildings 8 and 9. Building trend data: Actual building meter measurements from the Building Management System. Comments on data sources and reliability. Energy usage is based on trend data recorded starting November 2012. Individual equipment is metered to give the owners and design team feedback on performance of the systems. The intent is to allow long-term trending of the data and provide assistance in troubleshooting system problems. The system is still in the process of commissioning with hopes that the owner will find the data insightful and user-friendly. The data is sourced through the building management system and then combined in the DECK monitoring software for export and analysis. The DECK system was installed for monitoring the roof-mounted solar array generation; it now serves a double benefit by also tracking the building sensor data. The building features whole-building monitoring for gas, electrical, and water usage; and system-level monitoring for lighting, plug loads, HVAC and elevators. It also has room-level submetering for two classrooms which monitors lighting, ceiling fans, dampers, occupancy, slab temperature, plug loads, room temperature, ventilation air temperature, HVAC heat recovery and airflow. The project's engineers, PAE, have been sifting through the large amounts of data retrieved for the project and data reliability is a challenge, often requiring diving deeper into the data to sort out errors. We continue to learn about the building performance from data anomalies that reveal where lighting or heat recovery units appear to operate at unusual times. These symptoms appear to point at occupancy sensors that may not be calibrated correctly. The benefit of in-depth monitoring is to bring forward energy usage patterns that will enable designers to continue to specify more efficient systems and lower actual EUI. The building was designed to provide the occupants with a connection to the outdoors by providing natural ventilation, daylight, and views. This is accomplished through operable windows, skylights and stack ventilators. Recent studies by biologists at the University of Oregon and the University of Chicago have shown that higher ventilation rates reduce the amount of pathogens in interior environments. Buildings that use night flush have much higher air changes and thus tend to be much healthier work environments. Because of higher ventilation in this building, it always seems to be full of fresh air. Daylight also permeates the structure throughout. There are skylights in almost all spaces on the upper floor and light shafts that channel daylight throughout the ground level. Daylight strongly impacted the interior architecture, encouraging sloped ceilings, two-story spaces, and even the choice of specific finish materials. The Oregon Institute of Technology (OIT) partnered with Chemeketa Community College to introduce a dental clinic. In order to achieve a productive and healthy environment for the College and the complex, the faculty office suite was opened to encourage communication between allied health departments. This light-filled space has been successful in facilitating impromptu meetings, student advising and collaboration. To ensure an accessible building that would equally accommodate all users, the project incorporated a flexible design module. Spaces that were originally conceived as classrooms were later converted to office and treatment spaces for a partner teaching institution. A classroom initially programmed to be tiered was later adjusted to be a flat-floor design for flexibility. Budget and cost effectiveness were significant drivers to match program, user needs, construction costs, and sustainable long-term value. Green strategies were implemented as the payback fit the budget. The ability to stretch the budget to include these strategies throughout an integrated design process where each component was critical to the system's success helped avoid the removal of crucial items. The project included the preservation and rehabilitation of the existing aging science labs and nursing classroom building. While the existing structure was in good condition, it was in need of an upgrade to its MEP system. We were able to extend the life of the structure by successfully replacing its mechanical, lighting and plumbing systems. Synergies within the design team and client team are reflected in an integrated design approach with an integrated synergistic building. Bringing administration, facilities and building occupants together at project inception to establish goals created a high level of confidence. In an integrated design approach where all building components are contributing to larger energy and user comfort goals it is important to understand the constraints. Traditional cost cutting by removing or eliminating building components (sunshades, ceiling fans, reducing insulation) is not applicable due to the interdependent systems. Performance is measured by two methodologies. The first is user instruction, surveys and feedback. The second is analysis of the data provided by the building management system. SRG prepared the user guide for building occupants and presented this material at a staff orientation. We also prepared post-occupancy surveys to gather first-hand user feedback on the building's performance and comfort. The building now has active whole-building, system-level and specific classroom-level monitoring. This data is currently being reviewed by our mechanical engineer to verify actual performance against design-modeled performance. Describe how the owner/client benefitted. We demonstrated to the client that the building would not cost any more to build than a conventional design, while saving nearly $50,000/year in operational costs. In addition, the design did include space and basic provisions to accommodate future air conditioning if it was ever deemed necessary. This "insurance" served as another important strategy in addressing the client's concerns and minimizing the risks. Energy modeling and TAS modeling contributed to savings in construction and savings in energy usage. The owner and benefitted from additional design TAS modeling assistance through the Path to Net Zero Pilot program. The owner also received cash rebates from the Energy Trust of Oregon based on the purchase of efficient equipment and meeting a 60% below code goal for energy usage. SRG produced a User Manual upon the building's completion to help make occupants environmentally aware and show them how to "operate" the building properly. The 45-page booklet begins with "Why it Matters" so that users truly take ownership, and then explains how their actions play a significant role in reducing the energy use of the building. Participant in the Energy Trust of Oregon's Path to Net Zero pilot program. The project was featured in a Greenbuild 2013 presentation in Philadelphia entitled "Modeling, Metering, and Verification of a Passive Classroom Building."